EBSN has been publishing two different types of newsletters, the EBSN Newsletter and the EBSN-EPALE Newsletter separately in the past three years. In March the Executive Committee of the network decided to merge these two newsletters as the information EBSN shares in either of them is of interest for the target audience of both. From now on the EBSN Secretariat will only publish the EBSN Newsletter, in which we will share important EBSN related news and events as well as other relevant news, blogs, resources and events from EPALE with special emphasis on the upcoming events of the EBSN Capacity Building Series. REGISTRATION for the EBSN ANNUAL CONFERENCE 2018 is now OPEN! We are happy to announce that registration for the EBSN General Assembly and Annual Conference 2018 has been opened! 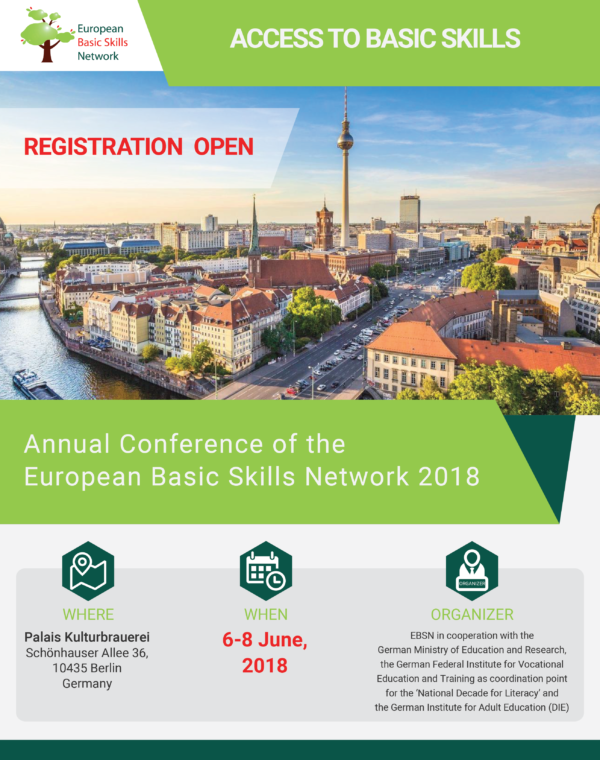 The main yearly EBSN event will be organised in Berlin, between 6 – 8 June 2018, in cooperation with the German Ministry of Education and Research, the German Federal Institute for Vocational Education and Training as coordination point for the ‘National Decade of Literacy’ and the German Institute for Adult Education (DIE). Hereby we kindly invite you to register through the EBSN website where you can find all necessary information and the conference program as well. When planning your journey please keep in mind that the event will start with the General Assembly on Wednesday (6 June) from 16.30 and the Conference will start on 7 June. The European Centre for the Development of Vocational Training (Cedefop) is currently working on a project focusing on the 'Changing Nature and Role of Vocational Education and Training (VET) in Europe'. The research will support the European Commission and the EU Member States in setting objectives for post-2020 European cooperation in the area of vocational education and training. The project is coordinated by 3s Unternehmensberatung and consortium partners include Danish Technological Institute (DTI, DNK), University of Warwick (IER, UK), Tallinn University (IISS, EST), Fondazione Giacomo Brodolini (FGB, IT), and the Federal Institute for Vocational Education and Training (BIBB, DE) as key subcontractor. A short online survey has been developed within the project. It focuses on major trends in VET that existed to different degrees across European countries between 1995 and 2015. The principal objective of the survey is to validate preliminary project findings as well as to set some parameters in the subsequent development of scenarios for VET in 2035. It is aimed at experts from various institutional backgrounds in the area of vocational education and training (and related fields such as labour market and social policy). Cedefop invites you to take an active part and share your views on the future of VET (https://ec.europa.eu/eusurvey/runner/ChangingVET2035). The survey is anonymous and will take around 15-20 minutes. Survey results will become available in the European Vocational Skills Week in November 2018. PROFESSIONAL DEVELOPMENT OPPORTUNITY FOR ADULT LEARNING PROFESSIONALS! DEMAL is a two-year European project involving EBSN partners from Germany (DIE), Switzerland (SVEB) and Hungary (Progress Consult, provider of the secretariat function of EBSN). Other partners in the project are organisations from Greece, Romania and Spain. DEMAL seeks to promote professional competences of adult educators in Europe in the areas of Designing, Evaluation and Monitoring of Adult Learning classes. In doing so, DEMAL refers to the European Framework “Key competences for adult learning professionals” which was developed in 2010 by Research voor Beleid on behalf of the European Commission. The DEMAL addresses two competences from this framework and thus two areas which are at the heart of an adult educator’s professional activity: Designing of adult learning processes and Monitoring and Evaluation of adult learning processes. • In the framework of the project European reference competence profiles, learning resource, two in-service training courses and a validation framework for the two selected competence areas,and an innovative digital app to support course planning are being developed and piloted. The first e-learning course on Design of Adult Learning Courses is available now for adult learning professionals all over Europe! Registration and further information is available on the DEMAL Project website.